Come join us for one of our semi-regular happy hours as we celebrate the Digital Revolution (while also denouncing the scourge of centralizing, totalitarian Digital Jacobinism). All those interested in technology, the freedom of technology and technologies of freedom are welcome. We’ll be at the Science Club at 1136 19th St NW, Washington DC from 5:30-8 pm. Yesterday was a big day for any business, nonprofit organization, or fundraiser that relies on affiliate advertising that depend upon Internet advertising for important revenue and fundraising efforts: Governor Schwarzenegger vetoed the nexus tax and calls up Overstock.com to invite to reinstate their affiliates in California. As we’ve written previously, all sorts of organizations depend on Internet advertising. Online companies are experimenting with new ways to deliver products, services, and content, and business of all kinds are going online to reach consumers and advertise to receptive audiences. The Gov’s veto sends a strong message that this growing business model is welcome in California. It is important to note that the proposed budget legislation was indeed a tax increase. Contrary to the statements of nexus tax proponents, in no event would new money flow into California. Any incremental sales tax collected from online sellers just moves from the California purchaser to the state treasury, at a time when households are being squeezed by a struggling economy. The result: fewer advertising dollars would flow to California publishers and websites who employ and serve California’s residents today. And this is one tax increase that would have serious unintended consequences. An affiliate advertising tax would harm California businesses, nonprofit organizations, and even public schools that depend upon Internet advertising for important revenue and fundraising efforts. In the digital realm you can try to keep Free at bay with laws and locks, but eventually the force of economic gravity will win. But Anderson’s wrong-headedness goes beyond this one case. Gladwell likens Anderson’s naivete about online distribution to that of Lewis Strauss, the former head of the Atomic Energy Commission, who Anderson himself quotes in Free. Straus famously—and as Gladwell points out, quite inaccurately—predicted that “our children will enjoy in their homes electrical energy too cheap to meter.” Gladwell points out that just as Strauss failed to realize that fuel was just one of many inputs to the distribution of power, Anderson fails to realize that while the price of transistors may be plummeting at logarithmic rates, other costs associated with digital distribution remain fixed or are increasing. Anderson’s responds to this critique in a post on Wired.com that fails to answer nearly any of Gladwell’s points, but instead asked why Gladwell felt “threatened” by Anderson. I doubt he does. Check out today’s Wall Street Journal editorial on the affiliate nexus tax that North Carolina is considering — aptly titled Tarheels vs. the Internet. This comes on the heels (pun intended) of news that Amazon will terminate its affiliates in North Carolina. It also talks about the tickets tax, which is blatantly in violation of the Internet Tax Freedom Act because it only applies to the Internet resale of tickets. 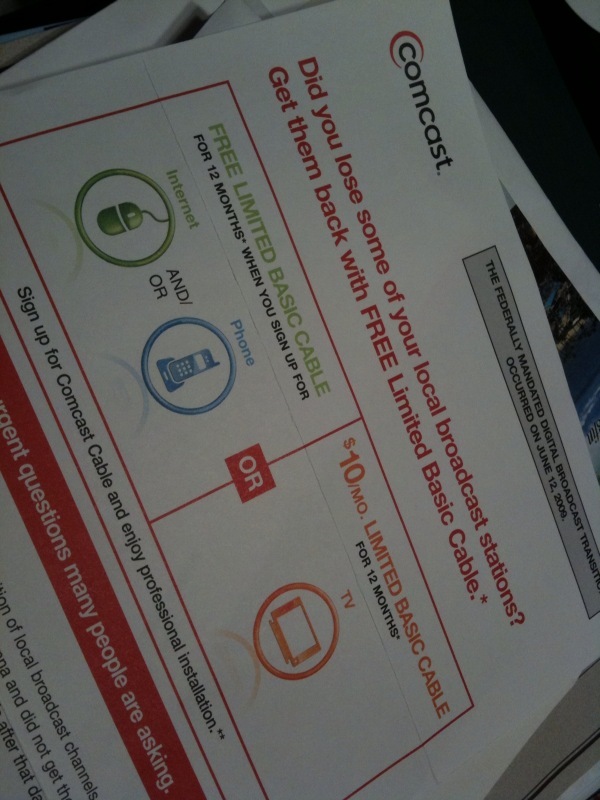 I received a mailing (see poorly taken iPhone photo) from Comcast a few days ago and I thought it was worth talking about from a libertarian perspective. I’m all for companies taking advantage of the digital changeover to make a little extra scratch, so long as they’re honest in doing so. This mailer never explicitly lies, but it’s not exactly forthcoming about what the digital conversion really means and it certainly didn’t mention the possibility of buying a converter box to continue getting broadcast TV for free. Small cellphone operators want Congress or the Federal Communications Commission to prohibit larger carriers from becoming exclusive providers of popular handsets, like the Apple iPhone (AT&T), Blackberry Storm (Verizon Wireless), Palm Pre (Sprint) and Samsung Behold (T-Mobile). These arrangements harm consumers in rural areas and decrease competition nationwide and do not enhance innovation. 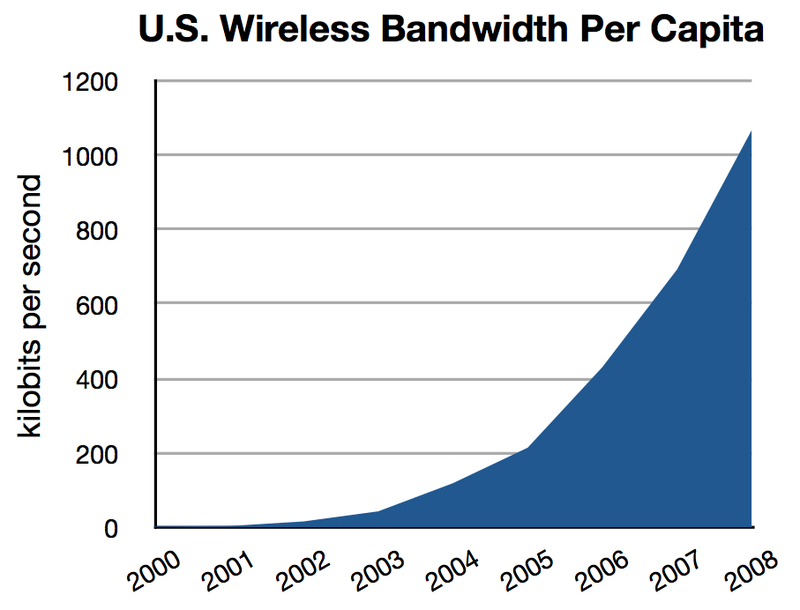 Vast portions of America – including all or part of Alaska, Arizona, California, Idaho, Kansas, Maine, Minnesota, Montana, Nebraska, Nevada, New Hampshire New Mexico, Oregon, Vermont, Washington, West Virginia and Wisconsin – are not served by any of the largest carriers, so Americans in these areas are prohibited from acquiring the newest and most innovative devices. There are advantages and disadvantages no matter where one chooses to live. The fact that someplace is without a particular amenity traditionally hasn’t justified limiting the ability of private entities to exercise their own judgment as to parties with whom they will deal. While I am fortunate to have the opportunity to own an iPhone, I don’t get to live in a pristine rural setting with a wide open outdoors, low housing costs, etc. I previously lauded the Sunlight Foundation for its intention to bid on the contract for updating Recovery.gov. There’s been extensive excessive discussion of it on the Open House Project Google group. The general theme among the one or two critics has been “leave the incompetence to the experts.” They’ve been a bit curmedgeonly, frankly. But an informative and balanced comment highlights the practice of “wiring” government contracts. The contracting authority gets together with the preferred contractor and they collaborate to make it very difficult for anyone else to win the bid. Government contracting officials aren’t used to encountering public scrutiny and political risk for their award decisions. They’re going to experience it here, and they should get used to it for the long haul. I am eager – nay, giddy! – to report on what happens. Kudos, and carry on, Sunlight.